U.S. intelligence agencies monitored two Russian tests of an experimental nuclear-powered cruise missile in recent months and found both tests failed to demonstrate the novel use of a reactor to fuel long-range flight, according to Pentagon officials. The two flight tests were conducted in the Russian arctic, including one in November on the island of Novaya Zemlya, the location of a Russian air base and nuclear testing site. During both tests, the nuclear power source failed to ignite. "Both times it didn't light," one defense official said. This official said the tests raised concerns Moscow created nuclear fallout from the missile impact, either in waters around Novaya Zemlya or on arctic land in northern Russia. Norway's Radiation Protection Authority detected small amounts of a radioactive substance called ruthenium-106 in October 2016. The particles may have come from the test of the nuclear-powered missile. The isotope is not found in nature. Russia denied the fallout came from any of its civilian reactors. During one test, a modified Russian military transport known as a Il-976 was spotted near the testing site along with vehicles related to Rosatom, the acronym for the Russian State Nuclear Energy Corp—an indication nuclear material was used in the test. Few details were available on the new missile, which has been known to both U.S. civilian and military intelligence agencies for at least a year and has been given a classified military designation. The weapon, however, was not mentioned in the Pentagon's recent Nuclear Posture Review among the new strategic weapons Moscow is developing. Russian press reports have said the missile could be deployed in 10 years. A second official, however, said the missile may have used a non-nuclear energy source to simulate the new technology. The missile was among several new strategic weapons disclosed publicly for the first time March 1 in a speech by Russian leader Vladimir Putin. The new weapons were unveiled days before Putin was reelected president, and were touted by the Russian leader as powerful strategic countermeasures to U.S. missile defenses and what he said was the threat posed to Russia from the United States and its allies. "One of these is the creation of a small-size super-powerful nuclear power plant placed inside a cruise missile like our latest airborne missile Kh-101 or the U.S. Tomahawk, yet with a flight range tens of times greater and, in effect, unlimited," Putin said. "The low-flying, stealth cruise missile with a nuclear warhead with a practically unlimited range, unpredictable flight path and the ability to bypass interception lines is invulnerable to all existing and future missile defense and air defense systems," he added. According to Putin, the nuclear-powered cruise missile was successfully tested in late 2017 from an unspecified central test range. Putin sought to portray the missile shown in a brief video as having unlimited range and the ability to navigate outside of missile defense radars. "No one in the world has anything like it," he said. 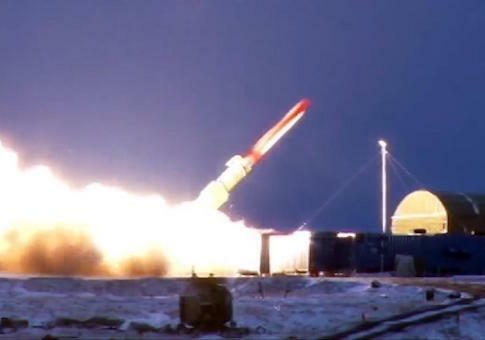 In the video, the missile appears to be launched from a road-mobile test launcher. A simulation of the missile's flight path shows a launch from Novaya Zemlya. U.S. video analysis of the new missile determined that it is not similar the Kh-101 long-range cruise missile and appears to be an entirely new system. Also, initial intelligence assessments of the missile based on the video suggest that it was powered by some type of high-temperature thruster powered by a nuclear reactor. The United States developed and tested a nuclear reactor-powered ramjet engine for missiles in the late 1950s and early 1960s, but eventually abandoned the program. Military analysts question whether nuclear-powered cruise missile would have additional value in penetrating enemy radars compared to a traditionally fueled, long-range cruise missile. Also, the high heat generated by the reactor could make the missile more vulnerable to countermeasures than an ordinary cruise missile. "During the flight, the power plant reached the designated output and provided the necessary thrust," Putin said. "The missile launch and tests on the ground make it possible to move on to the creation of a totally new type of weapon, a strategic nuclear weapon system with a nuclear-powered missile." The defense officials, however, said the Russian leader's boast was false because during both tests the missile's power plant failed to ignite. Missile experts said flight testing an active nuclear reactor is dangerous. "If the missile had ignited and then failed, they would have had a disaster on their hands," said former Pentagon nuclear weapons expert Mark Schneider. "My view is that this weapon is insane," Schneider said. "It is going to cause a nuclear disaster in testing. What do they plan to do? Dump it into the deep ocean at the end of a successful test? Even if they can soft land it with parachutes, the reactor will melt down because it won't have any cooling." Mitigating the effects of a nuclear reactor meltdown would be are very difficult. "There would be significant radiation release," Schneider said. "Depending where the wind was blowing, it might end up in Eastern and Western Europe. In my view Russia should be subject to serious economic sanctions for this system and Status 6." The Status 6 is a developmental Russian underwater drone submarine armed with a huge nuclear warhead. Russian military analyst Aleksey Ramm, who writes for state-run news outlets, reported last month that the new cruise missile is being built by Russia's OKB Novator, a manufacturer of missiles, including long-range cruise missiles. Ramm stated that public documents from Novator revealed the company is building two new missiles, designated 9M729, a conventional long-range cruise missile, and a second missile known as 9M730 that Ramm believes is the designation for the nuclear-powered weapon. The analyst quoted Russian experts as describing operations of the new cruise missile as employing a nuclear power plant to heat air to several thousand degrees and then creating thrust by ejecting the superheated air. A video of the new missile made public during Putin's speech show the missile employing four rear ports for thrust. Ramm said the missile was tested in the same region as Novaya Zemlya near a town known as Nenoksa. This entry was posted in National Security and tagged Russia, Vladimir Putin. Bookmark the permalink.